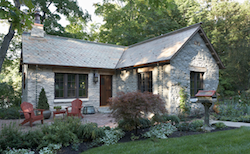 In this renovation of a gatehouse, great care was given to every detail to achieve stunning results. A mixture of old and new helped achieve the look, providing authenticity, comfort, and charm. The old elements included many reclaimed materials: granite from a historic bridge comprised the siding, reclaimed slate was used on the roof and brick finished off the masonry touches. In addition, beautifully patinated copper antiques accent the exterior. Giving the imposing granite façade its warmth are the inviting cottage windows. The home includes ample windows, including groupings of two and three units, to keep the indoors connected with the outdoors. These customized windows are wood Marvin casements. Authentic wood windows were chosen to compliment the reclaimed wood lentils that surround the windows. Marvin offers a non-crank-out casement which pushes open, eliminating the crank handle for a more timeless appearance. Other custom details that suited the meticulous detailing include hinged wood screens on the interior, harking back to windows from another era, and antiqued hardware that’s right at home in this heavenly retreat. What kind of cottage or retreat to you dream of building? Browse through this gallery to see more ideas from this fairytale renovation. Besides the customized windows, you’ll find lots of other inspiration to for your own dream.